I am a cellist based in Surrey Quays, currently completing my Masters at Trinity Laban Conseratoire of Music, in Performance & Music Education. In 2015 I graduated from Goldsmiths, University of London specialising in classical and contemporary performance and music education. I actively perform across London, in a variety of ensembles and solo. I have performed in events/venues such as: King's Cross 'Tete-a-tete Opera Festival', Cheltenham Music Festival, Cadogan Hall, Royal Festival Hall. I have a wide range of freelance teaching experience, where I have taught many different ages and abilities. I hold multiple fully enhanced CRB/DBS checks. 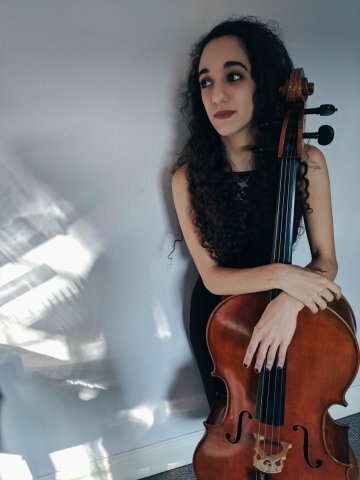 I am a cello tutor who enjoys teaching all ages and abilities, always aiming to inspire my students, driving them to improve and truly enjoy playing the cello! I am able to travel to students around SE London (particularly Greenwich/Hither Green/surrounding areas), or students can travel to my home in Surrey Quays for lessons. (Travelling to students will include a small travel fee). RoxannaFrom Kaiwen (5/5): Roxanna has taught my son and she is now teaching me to play the Cello. She pays attention to details and I particularly like the fact that mistakes are pointed out and corrected on the spot. I am confident that with Roxanna's help I will hit my target of being able to play Bach suite No. 1 within a year! RoxannaFrom Klaudia (5/5): Roxanna is a really great tutor. She is very patient but at the same time manage to be on point with the material that she teaches. She definitely knows how to teach and adjust lessons to achieve your goals regardless if you are interested in exams or not. My son enjoys her lessons and made fantastic progress under her tutoring. She also helps him to focus on tasks (which is not an easy thing) but also helps to achieve his privet ideas as well as material and techniques he needs to perform during the exams. We will surely continue lessons with her and I would recommend her lessons. RoxannaFrom Ferran (5/5): Roxanna is a great teacher that knows how to teach technique and focus on what you need, in my case I play just for fun and not aiming for exams and she accommodates the teaching based on that and its fantastic. She's patient and full of knowledge. RoxannaFrom Angel (5/5): Roxanna is a really patient tutor, she's nice and easy going. I really enjoy having my cello lesson with her and. Every time I finished my lesson I just love playing cello even more, and I'm sure I'll continue having lessons with her in the future. RoxannaFrom Marina (5/5): Roxanna is a fantastic tutor, she is very patient and helpful, but most importantly her lessons are adaptable for different people and I felt that really helped with my development. She also helped me find the cello and it is always trying to inspire me with extra curricular things such as documentaries. I would highly recommend her.